We recently shot the video and the still photos for my new book that will be out later this month. The book is called FBR SAVAGE Training: Transferring Gains From The Gym To The Field. Why do we call it “SAVAGE” training? “SAVAGE is an admittedly clunky acronym for Specific Adaptation thru Variability, Attractors, and Goal-directed Exercise. And… the word “SAVAGE” sounds really cool! Baseball training programs need to be practical and gains you realize at the gym aren’t worth much if you can’t use them correctly on the field. Therein lies the purpose of this book. In this book I’ll propose a new way to look at weight training, long toss, weighted balls and many other pitcher and hitter training models by fusing the concepts of self-organization and degrees of freedom (Nikolai Bernstein), differential learning and specificity (Frans Bosch), deliberate practice (Anders Ericcson) and traditional strength and conditioning within the Dynamic Systems Theory of motor learning. I’ve been a physical therapist and a baseball coach for over 24 years. I have studied motor learning and skill acquisition for nearly 35 years and along the way, I’ve come to believe that our traditional approach to strengthening baseball players is good, but not great. I’ve always felt that we were close, but that we were missing the mark with what we do in our strength and conditioning baseball training programs. Additionally, I witnessed far too many of our athletes getting lost in the false hustle of the gym, thinking that if lifting weights is good, then lifting more weight has to be even better. Players are often led astray by flashy internet buzz that suggests that if you can learn to deadlift or squat 2 times your body weight, you’ll suddenly be able to throw 95 mph and hit balls 400ft. But, as we all know, that simply is not true. For every guy who can dead lift 400 lbs and can throw it 95, I can show you 20 who can lift the entire gym and can’t throw it 85. And, I can show you another 20 who are milk toast in the gym and can throw straight fuel! But, before I jumped into the arena and began sharing my ideas on strength and conditioning, I thought I should be clear on what the current trends in the industry were. So, I went back to school… sort of. I studied for over a year and a half and took and passed the exam to become a Certified Strength and Conditioning Coach. I learned a ton of valuable information and developed a whole new level of respect for those in the strength and conditioning profession. The knowledge I gained in this training, along with my decades of experience as a physical therapist and baseball coach led me to develop the SAVAGE baseball training program. 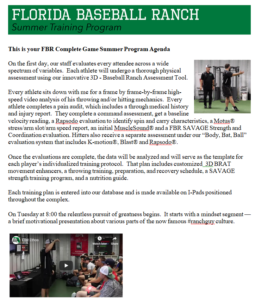 What Does The SAVAGE Baseball Training Program Offer? In SAVAGE I will offer a template for training that allows for all disciplines (the skill coach, the trainer, the PT, the manager, the strength coach, and anyone else who impacts an athlete’s preparation) to operate seamlessly under the umbrella of 5 thresholds of specificity that I believe will result in more efficient development and better performance in games. Muscles don’t rest in a ready position. They sag off the bones like the rope in this picture. This sag is known as muscle slack. In any athletic movement with a time constraint (like pitching or hitting), muscle slack must be removed rapidly to produce maximum usable force. Imagine a man pulling a car with a rope. Before he can elicit any movement, the man must first remove all the slack from the rope. Only then can he initiate the power necessary to move the car. Once the slack is taken up, the man can move the vehicle. This is how muscle slack works. To execute a 1.5 second pitch with maximum power, an athlete must be able to take up the slack in his muscles quick enough to reach maximum force at the optimal time. Dr. Bosch suggests that there are 3 ways to teach an athlete to take up muscle slack. Two of those strategies teach the athlete to remove slack unnaturally — in ways that cannot be used in performance. The 3rd strategy is more useful and therefore defines this threshold of specificity. One way to take up muscle slack is with a counter movement. The eccentric motion of a counter movement removes muscle slack and allows for the subsequent concentric move to produce force. However, most athletes don’t have time to execute counter movements before athletic maneuvers in competition, therefore using counter movements in practice is not recommended. If counter movements are trained and practiced regularly, they may actually degrade athletic performance, because in the game, you don’t have time to perform a counter movement (2, 3). Another way to take up muscle slack is to add an external load (as in a back squat) to the athlete’s body. But this is also an artificial way to take up slack and could actually degrade performance since in the game you don’t have the external load available to make it happen. The last I checked, they don’t let you take the Olympic bar out onto the mound or the batter’s box with you. Dr. Bosch suggests that as the athlete progresses toward a more elite level, traditional heavy weight training might actually be harmful for performance because it inhibits the body’s ability to rapidly take up muscle slack in a way that is not available in competition. We see 3 important points of co-contraction during the throwing movement. At the peak of leg lift we look for co-contraction of the muscle around the trail hip (glutes, quads, adductors and abductors). At weight bearing foot plant of the lead leg, we seek co-contraction of the muscles of the foot, calf, thigh and hip. And in the upper extremity, co-contraction of the muscles of the rotator cuff, and peri-scapular musculature when the arm is lifted to around 90 degrees abduction at weight bearing footplant on the lead leg becomes an important point of connection common to elite, durable throwers. These positions of co-contraction promote the rapid uptake of muscle slack and allow force to be developed quickly. The presence of muscle slack and the necessity to remove it rapidly is the reason we stress an even weight distribution through the Inverted Iron Pyramid as an important part of the pitching delivery. When the pitcher reaches the peak of his leg lift, we like for his weight to be distributed evenly across his entire foot. This forces co-contraction in the hip. If the athlete shifts the weight to the ball of the foot, the quads become dominant and the imbalance disrupts the co-contraction that is vital to the rapid expression of power in the drive leg. If the weight shifts to the heel, the glutes take over. If it shifts to the inside of the foot, the adductors dominate and if the athlete’s weight rolls to the outside of the foot, the abductors are more active. In all cases of asymmetrical weight distribution, co-contraction around the hip is corrupted and the resultant muscle slack interferes with maximum force/power production. In the gym, one of the most effective ways to force and train co-contraction is through instability. THIS IS VERY IMPORTANT: When we speak of instability, we’re not talking about standing on foam pads, Bosu balls, or doing squats on therapy balls. We are talking about instability, from above which forces co-contraction below. We introduce instability from above in a variety of ways. We use water-filled resistance devices, we hang plates from elastic bands on barbells and we perform athletic maneuvers within the other 4 thresholds of specificity while holding dowels overhead with wrist weights looped around them. The unpredictable variability of the resistance from above teaches the athlete to take up muscle slack quickly and naturally through co-contraction–a strategy that can be deployed in real time in a game. I cannot express how excited I am to share this new SAVAGE approach to training! We deployed SAVAGE training in our summer baseball training programs and saw some incredible gains made with regard to throwing velocity, command, elimination of pain in our pitchers and we also noted explosions in bat speed, launch angles, and exit velocities among our hitters. I’l share all those advancements in the book. I recently gave a presentation on the SAVAGE baseball training program to over 60 members of the Tampa Bay Rays coaching, training, and front office staff. The talk received rave reviews and led to an intriguing and stimulating exchange of ideas afterwards. I’ll be presenting SAVAGE training at the 2017 Texas Baseball Ranch Ultimate Pitching Coaches Boot Camp and the book and video should be out by late October. My new SAVAGE book will consist of about 25,000 words and the one hour video will included demonstrations and explanations of over 75 different exercises we use in our SAVAGE Training Program. 1) You can register for one of our weekend Elite Performers Boot Camps. We hold them every month. You can learn more about this life-changing event byclicking here. 2) You can call us at 866-787-4533 and schedule a Precision Strike One Day One on One Evaluation and Training Session. You can learn more about this service by clicking here. 3) You can enroll in our Complete Game Off-Season Winter Training Programwhere we’ll spend a few days crafting a customized plan to help him reach his goals. Click here. 2) Bosch F, Strength Training and Coordination: An Integrative Approach, 2010 Publishers, 2015. 4) Van Hooren B, Bosch F Influence of Muscle Slack on High-Intensity Sport Performance: A Review. Strength & Conditioning Journal. 39(1):91, February 2017. Volume 38, Issue number 5, p 75-87.